Ukraine inherited one-third of the Soviet defense industry ? 1,840 enterprises and research centers that employed 2.7 million people. Some facilities had unique capabilities such as shipbuilding and missile production. However, it was not a coherent national defense sector per se, but a fragmented collection of what used to be the mammoth Soviet military-industrial complex, which had to be transformed into the national defense sector of Ukraine. 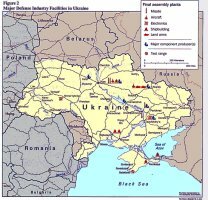 The military-industrial complex of Ukraine is the most advanced and developed branch of the state's sector of economy. Ukraine's formidable defense industry, which employed more than one million people and produced cutting-edge hardware like the Morozov Design Bureau's new BTR-4 and the AN-70. It includes about 85 scientific organizations which are specialized in the development of armaments and military equipment for different usage. The air and space complex consists of 18 design bureaus and 64 enterprises. In order to design and build ships and armaments for the Ukrainian Navy, 15 research and development institutes, 40 design bureaus and 67 plants have been brought together. This complex is tasked to design heavy cruisers, build missile cruisers and big antisubmarine warfare (ASW) cruisers, develop small ASW ships. Rocketry and missilery equipment, rockets, missiles, projectiles, and other munitions are designed and made at 6 design bureaus and 28 plants. Ukraine has certain scientific, technical and industrial basis for the indigenous research, development and production of small arms. A number of scientific-industrial corporations have started R&D and production of small arms. The armor equipment is designed and manufactured at 3 design bureaus and 27 plants. The scientific and industrial potential of Ukraine makes it possible to create and produce modern technical means of military communications and automated control systems at 2 scientific-research institutes and 13 plants. A total of 2 scientific-research institutes and 53 plants produce power supply batteries; 3 scientific-research institutes and 6 plants manufacture intelligence and radio-electronic warfare equipment; 4 design bureaus and 27 plants make engineer equipment and materiel. In June 2012 Ukraine’s Parliament released defense enterprises from the need to comply with public procurement law and associated tender procedures. Supporters claimed the move will improve these enterprises’ ability to gain state defense orders and strengthen Ukraine’s competitive position as a top world’s arms exporter. The Director General of the state-owned defense industry conglomerate UkrOboronProm, Dmytro Peregudov, commented that this move will significantly increase the international competitiveness of Ukraine’s defense industry, as in the past Ukrainian enterprises often lost prospective contracts due to the time and resources spent on meeting mandatory tender procedures. The new law also prohibited publication of information on procurement of military products, weapons, components, and spare parts with the justification that the publication of such information could threaten Ukraine’s national security and undermine the promotion of Ukrainian goods on the world market. Ukraine’s arms exports were expected to reach $ 1.5 billion in 2012, according to Kyiv’s non-governmental Center for Army, Conversion, and Disarmament Studies. This increase is driven by growing interest in Ukraine as a supplier during the past few years, due in part to a move by Ukrainian suppliers away from sales of obsolete Soviet technology and toward the production of Ukraine new types of weaponry – particularly in the areas of aircraft and armored vehicles, which constitute the largest share of exports. The existing structure of the military-industrial complex of Ukraine does not provide for the enclosed cycle of nomenclature of weapons and military equipment for the Armed Forces. Thus, the aim of military-technical cooperation is to create a cooperative system within Ukraine and at international level to meet the needs of industry in accessory parts and components, power supply batteries, cells, materials etc. Ukraine was deeply integrated into the former Soviet economy, particularly in the agricultural and defense industries. Upon achieving independence, many analysts believed Ukraine had the best medium-term prospects for economic development of any of the former Soviet republics, including Russia. Ukraine's vast agricultural resources, port and shipbuilding facilities, machinery sector, transportation network, and skilled workforce created a favorable investment picture. Ukrainian authorities, however, did not undertake structural economic reforms. In the early 1990s, Ukraine experienced serious inflation, privatization was at a standstill, real wages plummeted, and economic output continued its steep decline. Ukraine has well-developed scientific and industrial base. The national economy includes such spheres as heavy machine building, ferrous and non-ferrous metallurgy, shipbuilding, automotive industry (buses, cars and trucks), manufacturing of tractors and other agriculture machinery, diesel locomotive manufacturing, manufacturing of machine-tools, turbines and aircraft engines, production of power plants', oil extraction and chemical equipment and so on. Ukraine is also a powerful manufacturer of energy. Several fields of Ukrainian economy demonstrate high technological level of development. The country is producing carrier rockets, satellites and space research equipment. Ukraine is a considerable producer of military equipment, including tanks, military transport aircrafts, SAM complexes and optical equipment. Antonov aircraft, lighter-aboard ships, walking excavators, precise machinery, and electric welding equipment are produced using state-of-art technologies and comply with the top world standards. Despite being Tymoshenko's home oblast, Dnipropetrovsk has been decidedly "blue" in the past elections. Yanukovych took 61 percent of the final 2004 presidential vote, and PoR polled a near-majority in both the 2006 and 2007 Rada elections. A number of Ukraine's political and economic elite, including former President Kuchma and leading oligarchs like Ihor Kolomyyskyy and Viktor Pinchuk, had roots there. 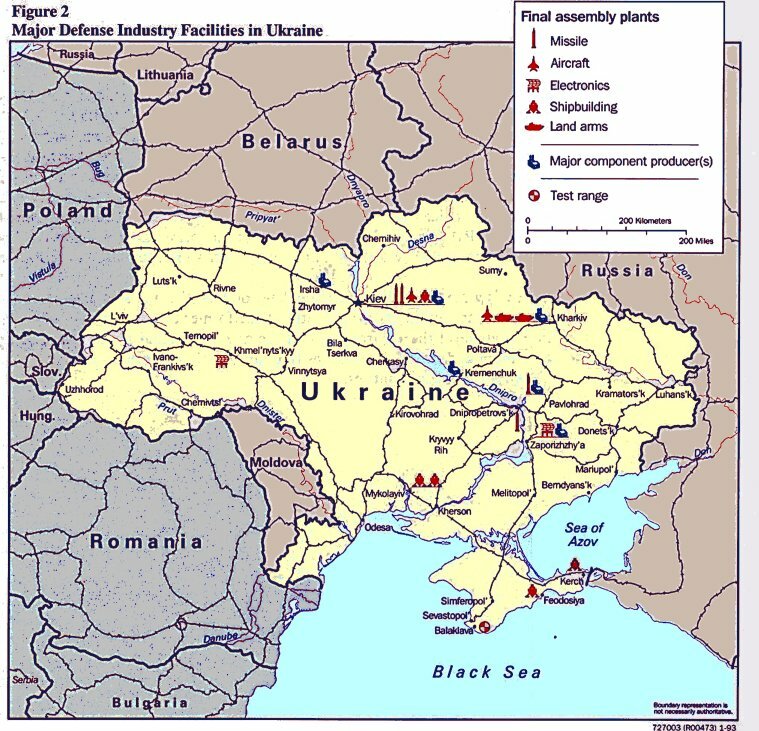 One of just a handful of "donor" oblasts to the national budget, Dnipropetrovsk is a major contributor to Ukraine's economy in metallurgy, the defense industry and banking, in addition to being a hub for rail and sea shipping and an agricultural center. As Ukraine acquired independence in 1991, one of the main objectives for the new government became the prevention of further decline of Ukraine's Soviet-style economy. Ukrainian society and the Government of Ukraine became aware that the state had exhausted its resources in supporting giant industrial enterprises, as well as collective farms. The only workable solution appeared to be fast privatization. However, the progress of privatization was extremely slow. In 1999, the state still owned shares in 6,500 companies, or 58 percent of all incorporated companies. The country's vast agricultural potential, its highly educated population, its transportation networks and the technological infrastructure it inherited from the Soviet Union provide Ukraine with excellent preconditions for strong economic growth. Upon gaining its independence in 1991 Ukraine focused attention on consolidating its nascent state and did not implement the types of deep structural reforms that laid the basis for rapid economic growth in some parts of Eastern Europe. Instead, it adopted a "go slow" approach to economic reform that led to nine years of successive economic declines. While the pace of reform has accelerated since early 2000, Ukraine is still far from joining the ranks of the world's developed market economies. Having taken serious strides toward fiscal and monetary stability which have stimulated significant economic growth, Ukraine must now create a strong legal basis for a market democracy in order to compete effectively for capital with its neighbors. After contracting in every year since independence in 1991, Ukraine's economy started growing in 2000, with real GNP growing by 5.8%, and industrial output, disposable income, and consumer spending all growing by double-digit figures. Corruption acts a severe brake on investment. Ukraine consistently ranks among the most corrupt countries in Transparency International's annual review of transparency and corruption. On Transparency International's Year 2000 Corruption Perception Index, Ukraine ranked 87 (tied with Azerbaijan) out of 90 countries. Only Yugoslavia and Nigeria ranked worse. A World Bank study published in 2000 ranked Ukraine among the worst Eastern European nations in terms of both administrative and state capture corruption. The World Bank defines administrative corruption as the taking of bribes and other illegal payments. In a 2000 business survey conducted by the International Financial Corporation (IFC), 100% of firms responding indicated that they had been compelled to pay unauthorized fees to obtain basic government services such as business permits, fire inspection reports, etc. An aggressive campaign instituted by the government of Ukraine to reduce over-regulation is leading to a decrease in administrative corruption but much remains to be done. Many observers believe administrative corruption must be addressed in tandem with the problem of unrealistically low government wages. As long as members of the Cabinet of Ministers make only about US$300 per month while police and other inspectors often make as little as $30, stamping out administrative corruption will remain difficult. Many observers believe that state capture corruption represents a more severe threat to economic growth and foreign investment. The World Bank defines "state capture corruption" as occurring when politically influential individual or groups use their power to appropriate for themselves sections of the economy. In Ukraine, a group commonly referred to as "oligarchs" control a significant portion of the economy, particularly in the spheres of mass media, energy and heavy industries such as steel and chemicals. Many of these oligarchs enjoy immunity from prosecution thanks to their seats in the Rada (parliament). The development of small and medium enterprises (SMEs) in Ukraine is hindered by an extremely stringent system of issuing permits and excessive government control of business activity. A pervasive problem undermining business development in Ukraine is the high number of businesses operating unoffi cially, without registration (at least 500,000, or 25% of the total number of active businesses). Business regulation based on permits and inspections in Ukraine is among the most rigorous in the countries of the former Soviet Union. Inspections continue on a massive scale, with nearly 95% of SMEs inspected by control authorities. The most active inspecting authorities include the State Tax Administration of Ukraine, the State Fire Safety Inspectorate (fire safety authorities), and the State Sanitary and Epidemiological Service (SES), each inspecting more than 50% of SMEs across the country in 2006.